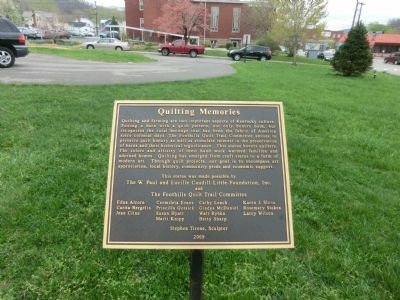 Quilting and farming are two important aspects of Kentucky culture. Pairing a barn with a quilt pattern not only honors both, but recognizes the rural heritage that has been the fabric of America since colonial days. The Foothills Quilt Trail Committee strives to preserve quilt history as well as stimulate interest in the preservation of barns and their historical significance. 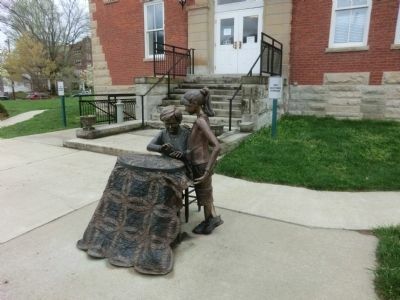 This statue honors quilters. The colors and artistry of their hand work warmed families and adorned homes. Quilting has emerged from craft status to a form of modern art. Through quilt projects, our goal is to encourage art appreciation, local history, community pride and economic support. The Foothills Quilt Trail Committee: Edna Alcorn, Carita Bergelin, Jean Cline, Carmileta Evans, Priscilla Gotsick, Susan Hyatt, Marti Knipp, Cathy Leach, Gladys McDaniel, Walt Rybka, Betty Sharp, Karen J. Slone, Rosemary Stokes, Larry Wilson--Stephen Tirone, Sculptor. Erected 2009 by The W. Paul and Lucille Caudill Little Foundation, Inc. and The Foothills Quilt Trail Committee. 11.07′ N, 83° 25.998′ W. Marker is in Morehead, Kentucky, in Rowan County. Marker is on East Main Street. Touch for map. This marker is on the grounds of the old Rowan County Courthouse. Marker is in this post office area: Morehead KY 40351, United States of America. Touch for directions. Other nearby markers. At least 8 other markers are within walking distance of this marker. County Named, 1856 (a few steps from this marker); Courthouse Burned (a few steps from this marker); Freedom Park (within shouting distance of this marker); Allie Young Law Office (within shouting distance of this marker); Moonlight Schools (about 500 feet away, measured in a direct line); National Register Historic District / Morehead State University (about 700 feet away); First Building And Land (approx. 0.2 miles away); Rowan County "War," 1884-1887 (approx. 0.2 miles away). 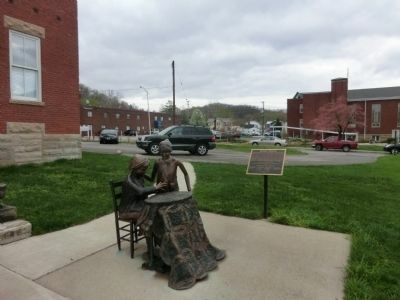 Touch for a list and map of all markers in Morehead. More. Search the internet for Quilting Memories. Credits. This page was last revised on June 16, 2016. This page originally submitted on May 17, 2014, by Don Morfe of Baltimore, Maryland. This page has been viewed 283 times since then and 3 times this year. Photos: 1, 2, 3. submitted on May 17, 2014, by Don Morfe of Baltimore, Maryland. • Bill Pfingsten was the editor who published this page.